The Dodgers beat the San Diego Padres tonight, 10-3. The story of the night was Hyun-Jin Ryu following up his six-inning, eight-strikeout shutout against the A’s with another great performance tonight. His final line — 6 IP, 3 H, 1 HBP, 9 K’s. This brings his season line to a 2.87 ERA, 1.02 WHIP, with 19 K’s in 15.2 innings. That’ll play. The Dodgers were coming off a win against Arizona in which they walked seven times, and the increased plate discipline resulted in seven more walks tonight. The two ex-Padres, Kemp and Grandal were 4-6 with 8 RBI. The actual Padres were 6-32 with 3 RBI. 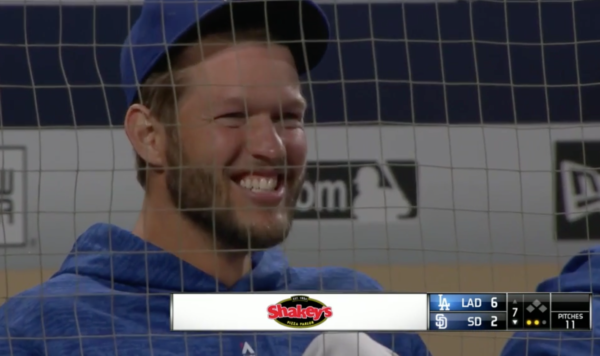 Clayton Kershaw was in good spirits on the bench. It was a fun one. Robbie Erlin started off the game strong with a 15-pitch 1-2-3 inning that consisted of four swinging strikes and two strikeouts. He averaged 89 on his fastball. The Dodgers offense looked to be starting the game off strong as usual in 2018. Ryu pumped up his fastball to 91 MPH at times in his own 1-2-3 inning. He looked confident in his 4-seamer and cutter and his location was sharp. Both pitchers worked around a tight zone. The marine layer won the top of the second inning, but the Dodgers still got on the board. Cody Bellinger worked a leadoff walk in the second inning, followed by a line drive single into the gap by ex-Padre Matt Kemp, who was thrown out trying to turn it into a double — 2011 Kemp makes it safely standing up. The other ex-Padre Yasmani Grandal roped a 107 MPH fly ball 395 feet off the center field wall, again batting right handed. The only explanation for his hot start is that he seems to be still upset that Cincinnati traded him for Mat Latos in 2011 (Latos was actually pretty good at the time). Puig, like Bellinger, started 1-2 and turned it into an eight-pitch walk. Farmer turned on an inside fastball that looked and sounded like a three run homer, but got caught up in the dense air just short of the warning track. 1-0 Dodgers. In the bottom of the second, Ryu surrendered a leadoff double to Hunter Renfroe followed by a two-run home run by Christian Villanueva, his sixth of the year. Two fastballs down the pipe, 2-1 Padres. Ryu struck out two after that to get out of the second without any additional damage. In the top of the third, the Padres who read DODI frequently, felt the need to validate my recent post and rewarded the Dodgers with some xwOBA and BABIP luck. This was legitimately fun. Taylor reached second via a leadoff fielding error and Seager launched a 109 MPH missile directly at Renfroe, but it carried on him likely due to the elite exit velocity. This scored Taylor and put Seager on third, unfortunately this was ruled an error but it really was launched. 2-2 Dodgers. Enrique Hernandez singled to center bringing home Seager, and Bellinger singled through the shift to put runners on the corners. 3-2 Dodgers. This brought up Kemp with runners at the corners, who was promptly greeted with boos for the second time tonight. He greeted San Diego fans with a first pitch, massive three-run shot to left center. Vintage Kemp. 6-2 Dodgers. Puig hit a 103 MPH line drive that Pirela caught on a dive, but overall this is an improvement. 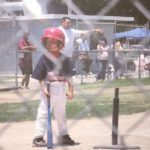 Eventually the Dodgers will stop hitting line drives directly at defenders. Ryu worked another 1-2-3 inning in the third, quietly up to five strikeouts on the night. Adam Cimber came in for the fourth and got through it despite a Pirela error in left field and some generally hard contact. The Padres defense had been very bad. In the fourth, Ryu hit Renfroe in the foot with a botched cutter, and gave up a single to Villanueva, but his seventh strikeout through four got him out of it. Dave Roberts — tired of fun, replaced Kemp with Joc Pederson to lead off the fifth. Pederson walked on seven pitches, which puts his walk rate at 15.6% and his strikeout rate at 6.3% (adjusted for both of his walks tonight). It’s a tiny sample, but it’s not nothing. Ryu worked another 1-2-3 inning in the fifth, striking out Pirela with a 91.5 MPH fastball for his eighth strikeout of the night. Ryu ended yet another 1-2-3 inning in the sixth with a swinging strikeout for his ninth of the night. This was a really great performance from him tonight even though he gave up two runs early. Kyle McGrath came in for the seventh to relieve Cimber, who put up three scoreless innings. McGrath got through the seventh in just nine pitches. Tony Cingrani entered in the seventh for the Dodgers. Cingrani has been arguably the Dodgers best reliever on the year with a 0.95 xFIP and nine strikeouts in 5.2 innings with no walks. He struck out Villanueva, then struck out Franchy Cordero, and got Carlos Asuaje to fly out. Cingrani is very good. Phil Maton was given the eighth, where he walked Grandal and Farmer, and allowed a 100 MPH line drive out to Breyvic Valera but allowed no runs. Fields had the eighth for LA, where he got through with one strikeout and one walk. He demonstrated a sharp 76-79 MPH curve, but only threw it four times. Kazuhisa Makita is awesome. He came in for the Padres in the ninth and got Taylor on three pitches, but gave up a double to Seager, who looks to be seeing the ball really well right now. He loaded the bases with a couple walks for Grandal, who promptly hit a grand slam. 10-2 Dodgers. Scott Alexander was given the ninth where he gave up three hits and a run, but also generated a patented double play to end the game. Can you blame him? Can’t get double plays without letting runners on. The Dodgers move to 6-9 with the win. Incredible. They’ll continue the series against the Padres tomorrow with Alex Wood (5.09 ERA, 2.09 FIP) making his fourth start of the year against Bryan Mitchell (5.27 ERA, 6.64 FIP, 14 BB in 13.2 IP). First pitch is scheduled for Tuesday at 7:10 p.m. Pacific time. Previous Dodgers @ Padres April 16, 2018: Ryu ready for a win streak?